Reverend Liu outside the Old People’s Centre in the yamen courtyard. 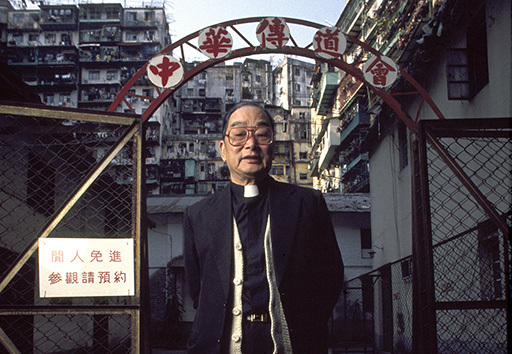 The Reverend Isaac Liu became a minister in the CNEC Living Word church in the late 1950s. Running a school, a clinic and a small chapel, he took over the yamen, the old magistrate’s buildings, at the centre of the City in 1971, protecting them from redevelopment over the next 20 years until forced to vacate the premises as part of the clearance in 1991. Originally designated by the HK Government as alms-houses in the 1930s, the yamen was the only building to be saved during the demolition of the City and, though heavily rebuilt, it can now be found in the Kowloon Walled City Park. “I was born in 1935 and came to Hong Kong in 1950 from my native village in China. I came because of the changes happening there, following the political upheaval of those days. If you did not follow Government policy, there was trouble. Everyone yearned for freedom and many tried to leave the country. Life was very difficult when I first arrived; only those who had a job could survive. I did not speak Cantonese and I often felt lonely and depressed. But then, one day, I met a stranger in the street, distributing pamphlets. He spoke in Mandarin: “Come and listen to the gospel tonight”. After that I started to go to church often. I learnt some hymns and sang them when I felt lonely and empty. I also read the Bible, and every time I found the feeling of emptiness disappeared. Within a year of putting my faith in Jesus, I wanted to tell everybody the good message and let them benefit too, but I didn’t know how as I still did not know Cantonese. But then, at one of our meetings, the preacher said they needed someone to help with the preaching. I volunteered and was sent to a seminary where I stayed for three years. It was during my time there that I began to work in the Walled City. To begin with, we rented a few wooden shacks and started a school for the children – mainly reading and writing. Then, in 1960, we started a Gospel Centre, in a four-storey building on Lung Shing Road. On the ground floor we had a chapel – with a small clinic and rehabilitation centre for drug addicts on the mezzanine floor above – and on the three floors above we started the Tak Shing school. At our peak we had more than 420 pupils, from kindergarten to primary Six. We taught the same subjects as other schools and most of our pupils came from the Walled City. In 1971 we moved to our present premises, which were previously a home for the elderly, in the centre of the City. 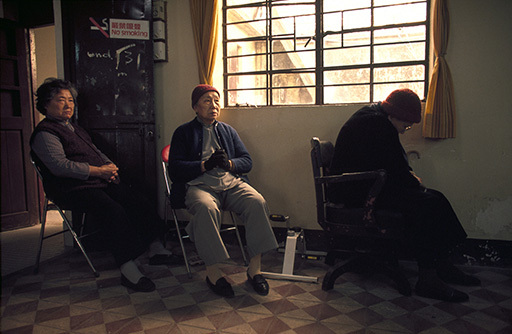 We continued to operate the school, chapel and clinic, but after a while the doctor moved to Yau Tong; he was upset because the drug addicts he helped kept going back on the habit. The Salvation Army took over his premises for a few years. We started the Old People’s Centre in 1979. At first we had very little money. We opened in the afternoons from Monday to Saturday, and on Sunday for worship. We applied for Government grants and when we received some support we started to organise more activities. We distributed pamphlets in the Walled City, but people didn’t believe we could offer so many activities for free. Only a few people came to begin with but, as they spread the word, numbers grew. Now we have 184 members. The Government has offered us a new place in Kwun Tong of about 1600 square feet, but our premises here are three times that size. 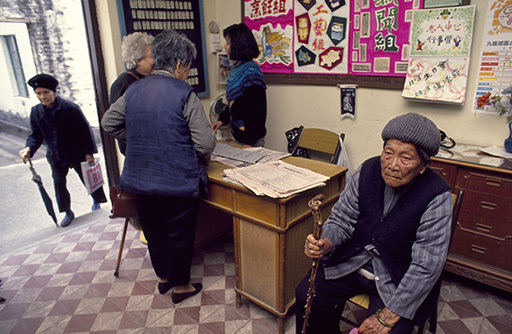 Only about a third of the elderly have moved out of the Walled City so far. We are arranging for them to join other centres near their new homes, and we will continue to serve the aged in our new district. Some of the elderly who have moved out wanted to travel back each day to the Centre, but we told them it was too dangerous. They complained that we didn’t want them any more, but we said that was untrue and that we were thinking of their safety. They wanted to come back because of the close relationships they had established here and because of the many benefits we offer. We provide afternoon tea including biscuits. The Social Welfare Department doesn’t like this as it fears it will encourage some people not to eat lunch. I explained that the elderly want to save money for their children in China and we were just giving them a little help, so the service has been maintained. When we move to our new premises we will not have a kitchen, only a pantry, but I suppose the needs of the residents there may be different. A few years ago we could only raise about $10,000 each year for our activities’ fund. Now, however, we receive an annual donation of $30,000 from the Community Chest and other funds from the church. This means we can now pay a salary to the two women who used to help us voluntarily. They are both mothers, but they work very hard and have never taken long periods of leave. And, since last year, we have also employed a supervisor, paid for separately by the Community Chest. We arrange trips which are always popular. Each time we have around 90 participants and need to hire three coaches. The two mothers and I lead the trips, and we have at last one trip or major activity each season.. I began living in the Walled City in 1971. I was not afraid as I had been visiting frequently since the mid-1950s. In the ‘60s there were many drug addicts – you could always see them from the roof of the school – and there were also gambling spots, vice establishments and live shows but these disappeared slowly during the ‘70s. We were not disturbed, as they knew we were operating for the welfare of the residents. Some of our members are very active, others are quiet and some are difficult to handle. Most are fairly independent and come and go as they please, but some worry that if they don’t come to the Centre every day we will have to close down. You have to have more patience when handling the elderly; you can scold a child, but not an old person. The Centre provided much needed companionship for those who lived alone. Elderly ladies were in the majority but some men attended too. 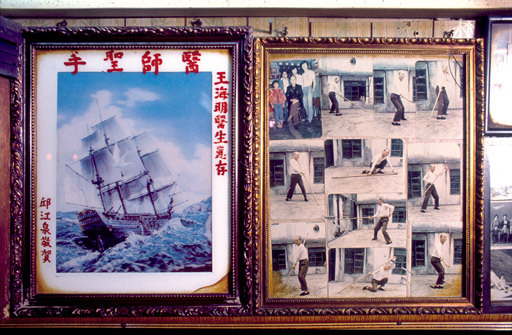 Lam Leung Po became a partner in his minced fish factory in 1983. 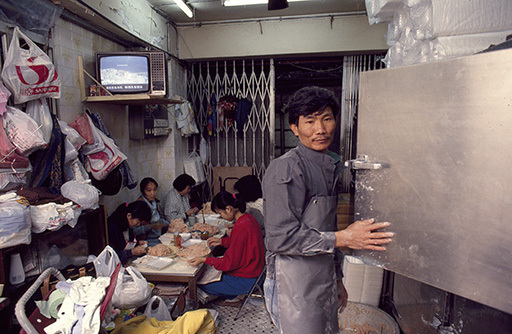 Located on the ground floor of 58 Lung Chun Road, his business was just one of many food-processing factories in an area conveniently close to the one Government stand-pipe to be found in the City, allowing clean water to be piped directly to a storage tank in the factory via a hosepipe looped across and along the neighbouring alleys. “This business has been here, in the Walled City, for about eight or nine years. 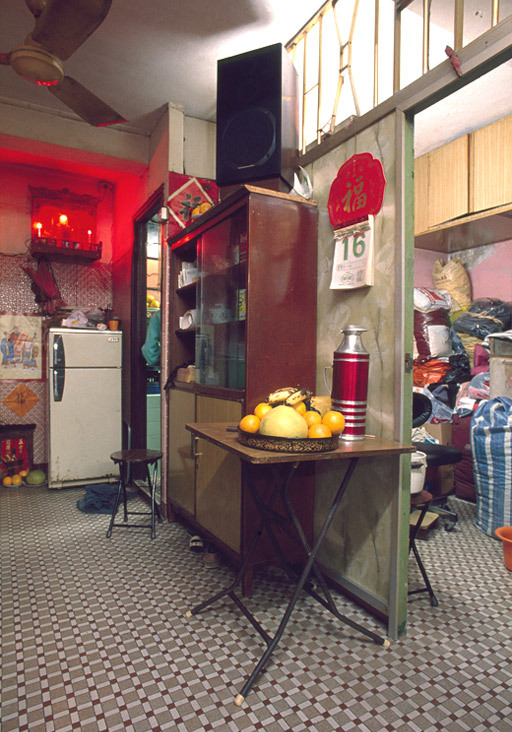 It used to be just outside, in the Sai Tau Tsuen squatter village before it was pulled down. That place opened a long time ago. I joined the business only after it had moved here. The shop’s quite big: around 480 square feet. We did a little decoration when we first moved in; it wasn’t always like this. I’ve no idea what it was before we arrived. Of course, it wasn’t that easy, but I wouldn’t say it was that difficult either. Nobody asked us for protection money. The rent was cheaper here and the hygiene regulations were not so troublesome; that was the most convenient part. Everything was much simpler here somehow. We’ve never had a hygiene inspector visit, for example, not once. Of course, businesses outside are doing things much the same way, but they need a licence. I could probably get a licence if I wanted to, since I’m doing the same job, but we don’t really need one here. What I’m making now is minced fish. We also make fish dumplings and squidballs – three products altogether. I’ve been making these since we started. The fish used in the dumplings is not the same as that for the fishballs; it’s eel which is quite expensive. The squid for the squidballs comes from Thailand. I used to mix things by hand, but now I use this mixer. It’s no big deal – just put the stuff in, mix it and then stir. There weren’t so many helpers in the beginning, but over time the staff has kept on expanding. A few neighbours – ladies – help me with the fish dumplings. I have five full-time workers as well, making seven of us in all with me and my partner. 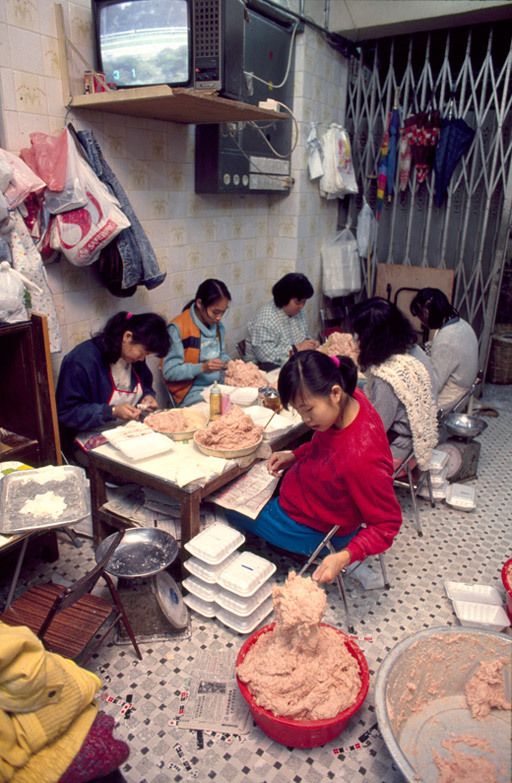 The dumpling makers are just part-time. 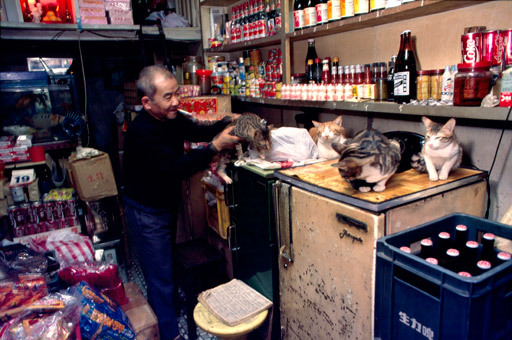 We make about 300 catties of minced fish a day. If we have more orders, we just work harder. It would be easier if we had more helpers, but I won’t bring more people now. 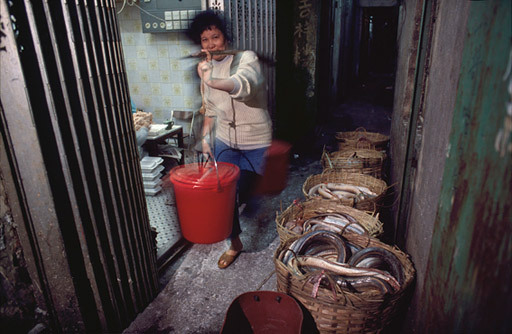 Baskets of eels wait to be processed in the alley outside the factory. 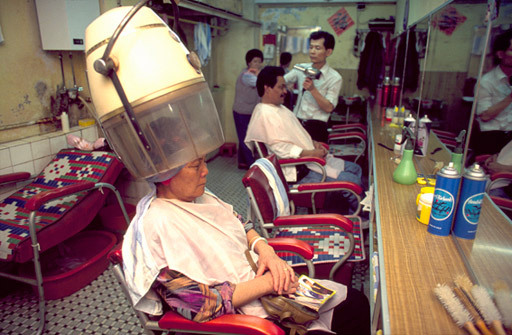 Though he had lived in the City for much longer, Ho Chi Kam only took over the running of the barber’s shop at 10 Tai Chang Street in 1985. Located just a short distance from the sole government stand-pipe within the confines of the City, it was unsurprisingly a fairly prosperous business whose customers – mainly local Walled City residents – would occasionally have to queue for service. The shop eventually closed in late 1991, shortly before the start of phase two of the clearance. Ho was unhappy about this and would only give a short interview. I first read about my flat in Shing Pau Daily News; I bought it and moved in at the beginning of 1974. The flat is on the Tung Tau Tsuen Road, so I didn’t really have to come inside the City until I started running my own barber’s shop. Then I came every day. Before that, I worked in the same trade for other people. This place belonged to a friend who offered it to me when he decided to leave. I had to borrow some money to set myself up, but I’ve been here for five years now and I am the sole proprietor. We are the only hair parlour inside the City and my customers are people living nearby. So many people used to live here that if only one in a hundred came to me, I would have enough business. We set the prices as we liked, but we were cheaper than the barbers outside. My wife and I both worked, and sometimes there was a lot of business. We used to open at 9am and close when there were no more customers – it was very flexible. There were no problems with supplies as we paid on delivery. Now that the Walled City is to be demolished, I have started working for others again and only come here on Wednesdays, my day off. Of course, from the point of view of my business, I’m not happy about the demolition. Running the barber’s shop here didn’t make me wealthy, but I didn’t have to worry about my next meal either. Now, working for someone else, I only receive 30 per cent of every $100 I earn. I have to bring in $300 for the boss before I can get $90. I would be able to earn that doing just one head. However, there is no choice. We have to move whether we like it or not. The only problem is that it’s not possible to start up a similar shop outside, because I couldn’t afford the rent. 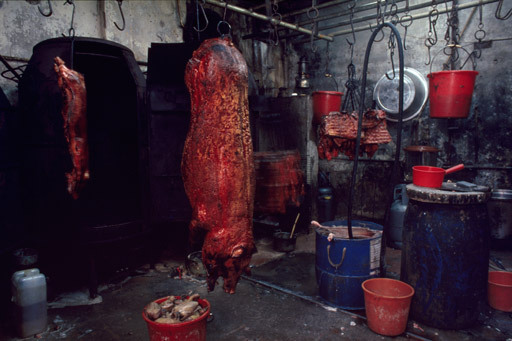 Yim Kwok Yuen opened his cooked meat factory on Lo Yan Street in 1981, a few years after his arrival in Hong Kong and just three years before the City’s clearance was announced. A thriving business, he and his brother continued working there until the factory was closed during the first phase of the clearance operation in the summer of 1991. “I came to Hong Kong in 1978, when I was 35 year old, from Ching Yuen county in Kwangtung Province where I was a farmer. My parents were old and, as the eldest of my five brothers and sisters, I had to support the family. Life was not very different from death in China. We worked really hard for very little return. I started work at 4am and my daily salary was 20 to 30 cents. We did not have our own farm and, when hungry, we only had rice husks or the grass to eat. You felt cold and hungry in the winter, and in the summer there were lots of mosquitoes. From 1971 onwards, I tried almost every year to sneak into Hong Kong. I didn’t have to swim far but I had to climb hills after crossing a river about one metre deep. I was scratched by the bushes. I always used the same route, and each time I was caught I was imprisoned and starved. I often fainted. If I had been given my own fields I would not have tried to come here. 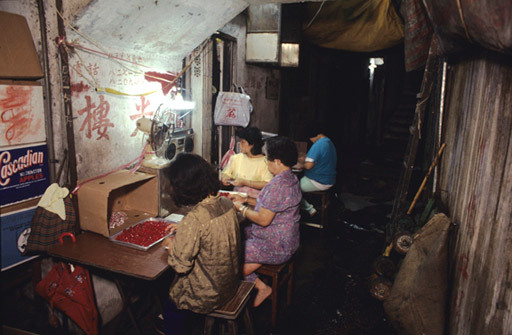 When I finally arrived in Hong Kong, I lived with my uncle and worked in a shop which made roasted food. After several months’ apprenticeship, I went to work in my uncle’s roasting shop in the Walled City. When my younger brother arrived in Hong Kong three years later, I started my own roasted food business, selling the cooked meat on the streets. Initially, I made the roasted food in my uncle’s shop and sold it. Then I rented this processing shop three years ago. I sell the food on the streets myself. If I delivered it to a retail shop, the profit would be much less. I am unlicensed hawker and I sell in Wong Tai Sin market. I have been arrested five times since the computerisation of records. You have to deposit a bail of $700 and the fine is $500 increasing by $10 for each arrest. In Wong Tai Sin, they confiscate the food but return the tools and cart. The cart is worth more than $1000. I start work every day at 4am. I do not need an alarm clock – my body wakes me up. I start to roast the meat then, and sell it in the market from 6:15am to 8am. As I am a hawker, I am not allowed to sell in the streets after 8am. I then come back for breakfast and at 9am start work again to prepare the meat to be roasted in the afternoon. At about 10am I return home to cook lunch and have a rest before coming back to the shop to roast. At about 3pm I go to the market again, returning home at around 7 or 8pm. My brother and I manage the shop here. The roasted food we prepare includes chicken, goose and pork. To make the food, we use flavouring, salt, sugar and so on. I you can afford it you can use good Chinese wine, but otherwise a cheap one will do. 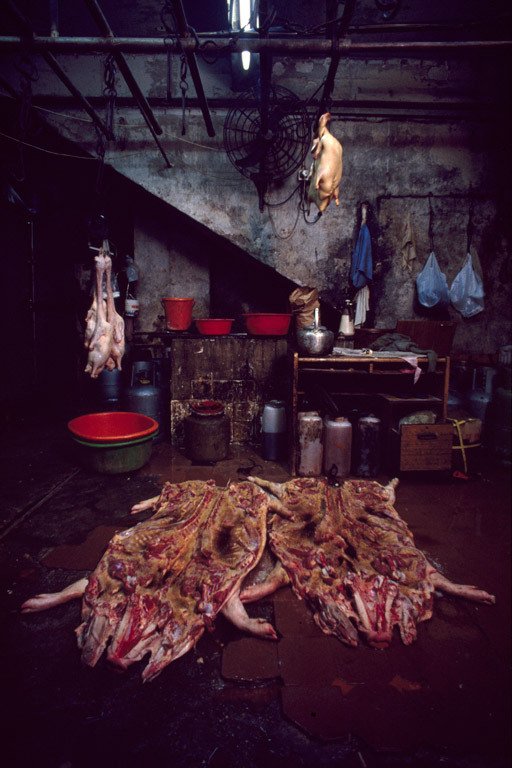 For pork, we have to call a buyer to purchase a pig from the Cheung Sha Wan abattoir. When the pig is delivered, we cut it, wash it and put it in the refrigerator. We normally have 10 or more pigs in stock. The whole process of preparing one roasted pig takes three hours. The cooking itself takes an hour. 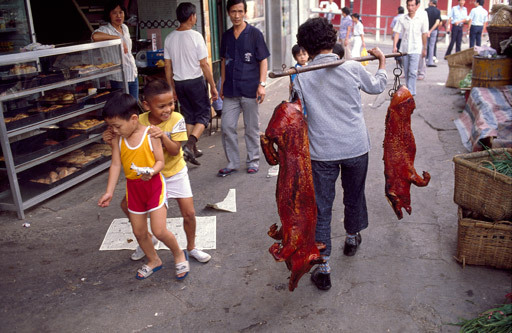 You have to roast the pig until it is 20 to 30 per cent cooked, take it out of the oven and pierce it to let the air out from the skin – otherwise it does not look good. Then you have to heat the skin with a hot flame so that bubbles appear and make it crispy. We use the cart to carry the food to the market. We work hard, even though the temperature is very high in the summer. The refrigerator is noisy, and the oven is noisy and hot. We sweat tremendously. We have fans in our workshop, but we have no cover in the market. We have cockroaches and rats too, which we feed. Occasionally, of course, when our customers criticise our food or don’t buy it, we feel unhappy. The life is difficult but, as the returns belong to us, it’s worthwhile. We mostly sell roast pig. If the hawker control team doesn’t come, we can sell about three pigs in one day and earn $2000 to $3000; if the team comes, we can only sell one. During the festival periods we can sell 20 to 30 pigs in a day, and as festivals always fall on public holidays the hawker control teams don’t come. We have no sleep on those days. The shop is not licensed either and is rented. Outside the Walled City you must have a licence, although the Government has stopped issuing them for processing shops and only grants them to retail outlets. We have never been inspected, but we are cleaner than the famous workshops outside; they often don’t wash and clean the pigs first. When I had earned enough, I went to Canton and got married. I now have a son and have applied for my wife and child to come to Hong Kong. I first applied eight years ago, but I’ll be satisfied if they can come before the Walled City is demolished. I own two flats in the Walled City. The first one cost me around $80,000. The living environment is bad and it has no windows. The second flat is a few stories higher in the same building and it has windows. I had intended to sell the first flat, but then the demolition was announced. The compensation for demolition is around $800,000 for the two flats. My brother, my uncle and I live together in one flat. The other flat is rented out at $800 a month. Before I bought the first flat, I rented a place here in the City – eight single men lived in a room of 200 square feet. There are three bedrooms and two living rooms in my house. We have an air-conditioner, though we only use it on the hottest days; we also have a television and a washing machine. The rent for the workshop is $2000 a month, with electricity and water charges included. I believe that half of the water is stolen from the mains, while the other half comes from the well, We all use well-water but we use water from the mains for drinking. We have never had a power failure. I don’t think I will make any profit from the demolition of the Walled City except that I may get a new house. For rented premises, the Government will only compensate with a relocation fee. When I started my business, the initial capital outlay was $30,000 but I would need $50,000 to start up again. I have not decided where to go after the demolition. If I opt for a unit on a housing estate, the compensation will drop from $400,000 to $130,000 and I have to pay the rent. If I buy a new house, I need several hundred thousand more for renovation. I also have to give a house to my brother. If possible, I would like the Government to compensate me for the shop by giving me a stall; It will be difficult to operate a processing workshop in future. If I want to have it properly licensed, I will have to go to a rural area. The roasted food will have to be transported to an urban district and it will be cold before it gets there. I have to decide on my place of business before I can decide where to settle. Chun Lo Ying moved into the Walled City in 1958, and lived in various buildings there before buying an apartment on the fourth floor of 82 Lung Chun Road, overlooking the park. 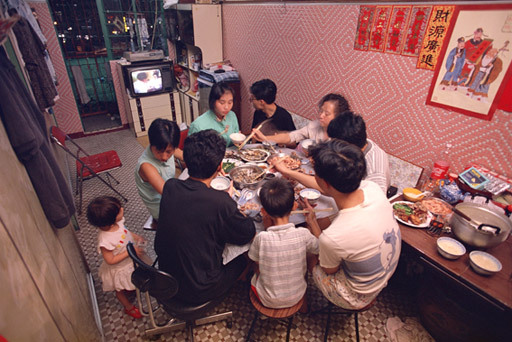 She was regularly joined for dinner by one or two of her 10 children, including Chung Kwai Mao and Chung Yuk Yee both of whom also lived in the City. “I have lived in the Walled City for more than 30 years, and in this flat for more than 10. Before coming to the Walled City we lived in Hung Hom, but we were robbed and really scared, so we decided to rent a place here. We agreed with a Chiu Chow family, whose wooden hut had burnt down, to build a new house on their land. We would pay for the construction and get the first floor and they would keep the ground floor. That place soon became too small, so we rented another first floor apartment instead. After 10 years or so we decided to buy that place, and then two or three years later a construction company talked us into an exchange arrangement. The company offered us a first-floor flat in the new building, if they could develop our existing place. The developer asked people with whom I was friendly to negotiate on his behalf and we struck a deal. The old four-storey building was to be developed as a 13-storey unit and the building next door as 14 storeys. A unit like the one we are now in cost around $120,000, sometimes a bit more; the ones in the middle of the City were only worth $80,000. I signed an agreement with the developer at a tea house with a witness. I had heard of the Walled City before moving in, but I was not particularly worried. You got used to it. Getting water was troublesome, and the drug addicts used to quarrel and get into fights. I told my children just to ignore them or stay at home. Usually we were not bothered, although my second daughter was robbed once, probably by an outsider. I have never really explored the place; I just use the main streets. I hardly know the names of the alleys. 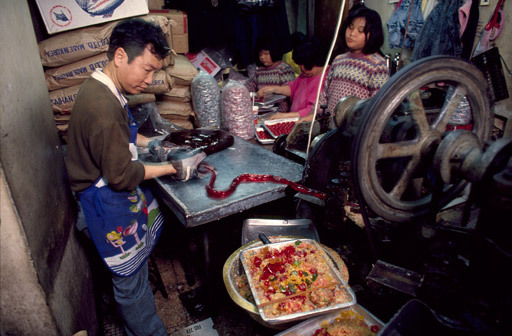 Hui Tung Choy opened his noodle factory at the back of 2 Kwong Ming Street in 1965. In 1992, he was married with two young daughters. “I came to live with my aunt in Hong Kong in 1947; I was 16 and my parents had died. 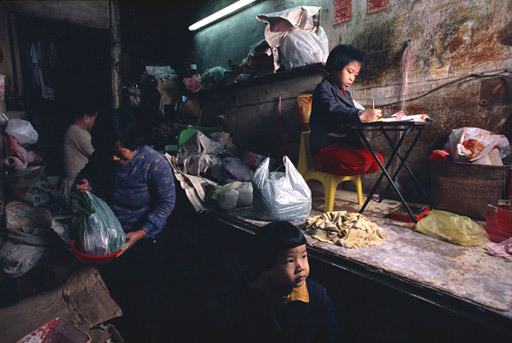 I was brought up in Sun Hui [Guangdong] and I’d only ever been to primary school. 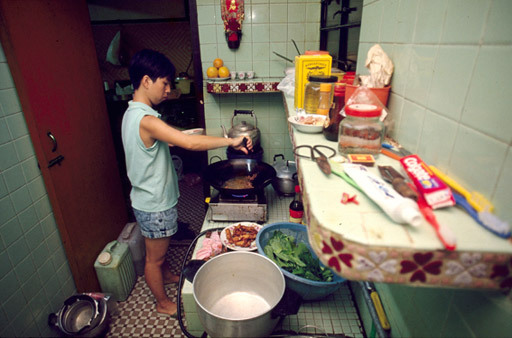 After I arrived, I didn’t do much of anything for a while, until I began working with my cousin making noodles. I then opened my own noodle-making place with a friend. We needed a little capital to buy the machines, but flour was supplied to us on credit. One person can make about five or six packs of noodles a day, which is around 300 individual ‘discs’. It’s crowded here and tough work. We used to employ five people when the business was at its height in 1980; we were producing around 1000 discs a day then. We also employed two young lads to deliver to customers: one in the morning, the other in the afternoon. But young people today don’t want to work in a place like this. My partner fell sick and he and his wife decided he should drop out, so now I work on my own. I’m just about able to scrape by. We chose the Walled City because rents were low and you didn’t need a licence To set up outside you’d have to go through various Government departments – labour health, fire services and so forth. The City was Chinese territory so no one took much notice of what was going on here. 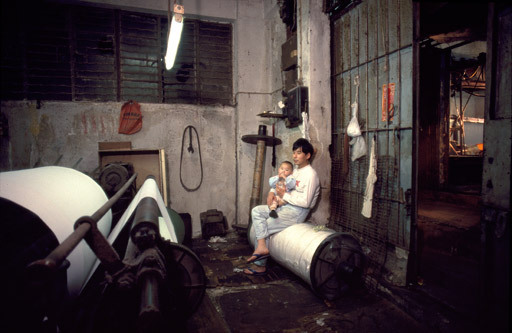 One of 12 children, Lau Yeung Yin took over the family weaving business from his father in 1982, running the company from a small factory on Sai Shing (West City) Road. “I was born in the Walled City. My father arrived in Hong Kong the day before peace was declared. 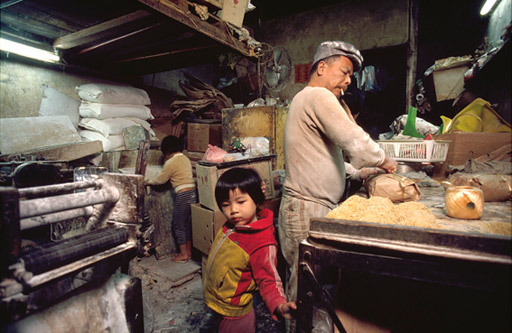 He settled in the City and began to run a weaving factory, just as he had before in his home village and in Canton. The Walled City was a better place when I was a kid. There were just two- or three-storey stone and wooden houses then. Dad’s factory was on Lung Chung Road. I think he just squatted and occupied the space. I have 11 brothers and sisters, but we were not all living together. One sister was left in the home village on the mainland, another sister was given away and an elder brother was married before I came along. We lived in the factory. There were no beds; we just moved the yarn and cleared a space when we wanted to sleep. We used water from the wells at the beginning and then we were served by taps outside the City. Instead of coming straight home after school we sneaked out to play, but if I came home too late Mum would beat me. We went up into the hills, sometimes as far as Lion Rock, and played hide-and-seek. One of our great joys was to have a little money to buy sweet potatoes and have them baked. When I was very young, I was unaware of the existence of anything bad. It was only when I was 14 or15 years old that I started to be aware of the gambling dens and the drug addicts. It was quite a sight to see a line of heroin addicts squatting along the alley taking their drugs. People who came from outside to take part in such goings on would not bother the local residents. In the early 1960s, the Government tried to demolish the Walled City and a big fight ensued. Dad was the treasurer of the Kai Fong Association then. Three days before the demolition was due to take place, they sent a telegram to Beijing and the Chinese Government responded by demanding compensation and resettlement on the residents’ behalf. Dad was fairly neutral in his politics – the Kai Fong also sent telegrams to Taiwan and it was just a matter of who cared the most. I became a tailor’s apprentice, but only for a few months when I left school. Then I went to work in a rattan shop for my brother-in-law on Hong Kong island, and lived and worked there for several years until I was 19. Following that, I went to work at Dad’s weaving factory until I was married, at the age of 21, and then went back to the rattan shop. A while later, I was asked to return to help in Dad’s factory – my younger brother had taken it over by then. Dad trusted him, but he was just taking money from the till as he saw fit. We were making fabric for gloves and I was paid $1500 a month. I have a son and a daughter who are studying in Wong Tai Sin. We have a public housing unit in Tai Po and we go there sometimes. We rarely sleep there though, as it is too much of a rush in the morning to get the kids to school on time. Lee Yu Chun worked in the family’s candy business from its beginning in 1964, when she was not yet 10 years old. 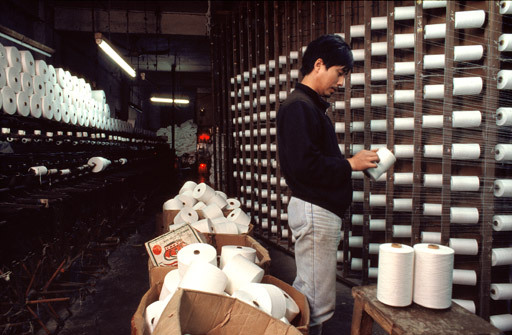 Established in Sham Shui Po, the factory moved to the City a few years later, and to its final location at 12 Sai Shing Road in the early 1970s. 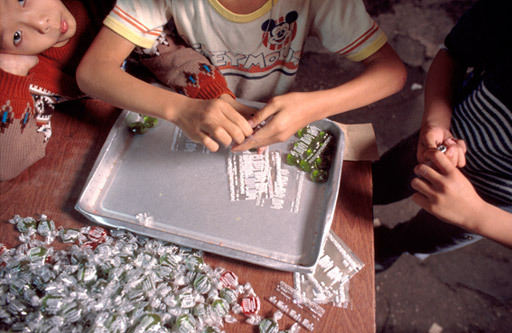 “My family opened their first sweet factory when I was a kid. My father came back to Hong Kong from abroad and began manufacturing soap at first, but I liked lollies. We were living in Sham Shui Po and I used to buy sweets for myself from a neighbourhood factory; I think this inspired him to start his own sweet-making business. We used a charcoal stove in the early days and then later switched to a kerosene one to melt the sugar – about 10 pounds or so at a time. We didn’t have any machines and so pressed the sweets out manually. We didn’t have many customers either, so my elder brother would go around introducing our products. Our company is called Chui Fung and it’s very much a family business, although other people in the neighbourhood are employed to help. 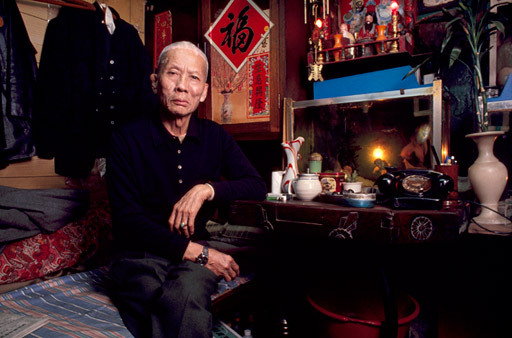 Born in Po Ling, China, in 1920, Wong Hoi Ming spent much of his youth in Thailand before being expelled back to China in 1938 for campaigning against the Japanese occupation of Manchuria. 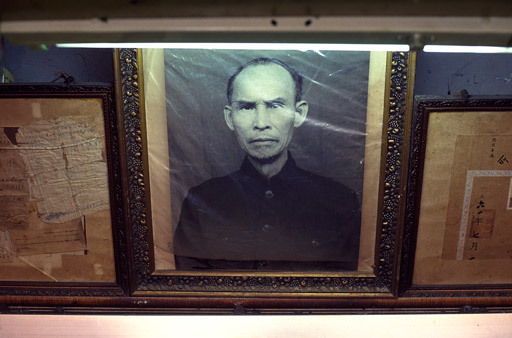 Leaving his wife and family to protect the family land in China, he fled to Hong Kong alone in 1949. “When I first arrived here from China, I became the head of a ‘coolie’ gang on Hong Kong island in Western District. I was pretty good at martial arts, and when people were injured in fights I would fix them up. You see, I’d learnt a bit of medicine and kung fu when I was in Thailand, and I then studied under some masters in Chiu Chow. I was persuaded to take my medical practices more seriously, and a friend helped me to get a business licence. I began practising on Hong Kong Island, but when the building I was living in was demolished I moved to the Walled City. I’d been coming here once a week for several years to teach martial arts, so I knew the place quite well and knew it was cheap. My students came from all walks of life – some were drivers, others fish sellers, factory hands, air conditioner repairers, you name it. They were learning martial arts for self-defence. I didn’t ask for money when someone became my student; they would just burn some incense and that was it. There was a time when I let people play mahjong here. There was room for two tables and I would charge a small commission; people would also leave what they wanted for the facilities. But I stopped that a few years ago. It’s a small space and if patients came for a consultation when the mahjong players were here I couldn’t really do my job properly. Also, the women patients were too shy, especially if they had to take some of their clothes off for treatment. Most of my patients suffer from rheumatism, though I also treat people with fight injuries, back problems and numbness in the body. I’ve got them all written up. My treatment includes the identification of the main symptoms, the use of heated cups on the body for suction and the application of herbal poultices. I also use massage and stretching. I make hot herbal medicines as well, and many people come to buy these for their rheumatism. Most of my clients come form Kwun Tong [a working class industrial area in Kowloon], though there are some who come from as far as Shatin and Aberdeen. I don’t have fixed fees. If my clients seem to be well off, I suggest they give me more; if not, I ask for less. A patient from Kwun Tong – a vegetable seller – always brings me a carton of cigarettes! I could be charging $400 to $500 for a single treatment if I wanted. My income’s never very stable, though. Sometimes, I don’t get a single client for days or even weeks. 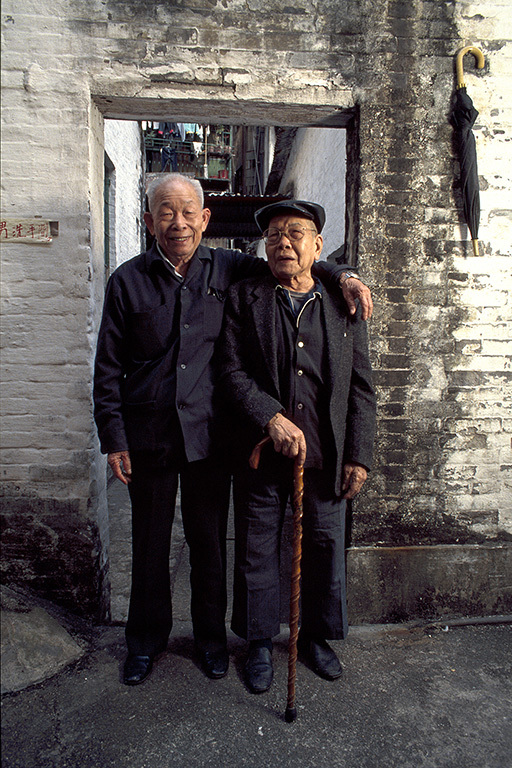 Born in China in 1916, Lam Tseng Yat arrived in Hong Kong 10 years later, with his father and four brothers. 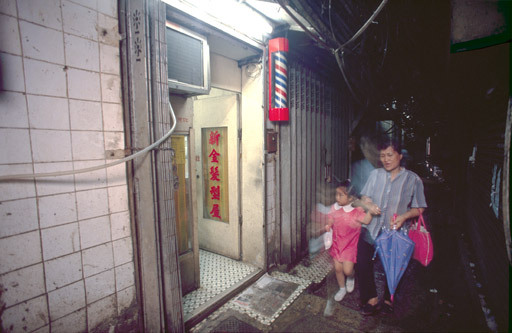 In 1947, they bought a small property at 25 Tai Chang Street and opened their first store. “Our business has been registered with the Government for more than 20 years, and our shop has existed for more than 40. We registered because it meant we could make use of the facilities offered by the banks, but it’s not really necessary. The demolition is a real problem. From the outset, we have demanded a shop for a shop, and living quarters for living quarters from the Government. The compensation is such a small amount of money; how can we survive outside? It isn’t even enough to set up another shop. We shall be jobless. If they won’t give us a place for a new shop, they should give us sufficient money to buy one – and that means nothing less than $1.5 million. I have lived here all these years, with my wife. All my children were born here; they were married here. We lived on the first and fourth floors of this building, but when my children moved out we sold them and now I live in the shop. My fourth brother has 12 children and they lived in the City too. 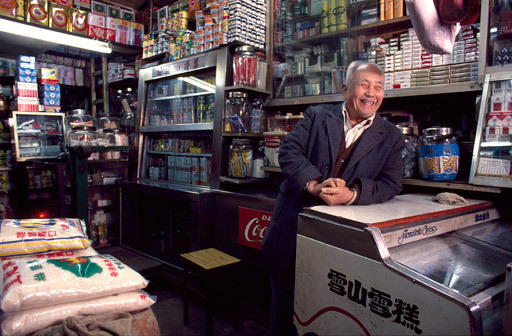 Lam Tseng Yat lived in the City and ran his shop on Tai Chang Street for over 40 years.